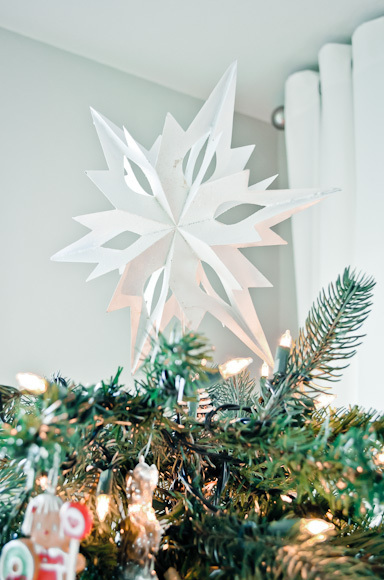 Do you oogle the gorgeous designer Christmas trees that grace the magazine pages and Pinterest boards this time of year? Textural burlap and natural elements are all the rage right now, but this colorful beauty from Inspired by Charm made my artist heart skip a beat! 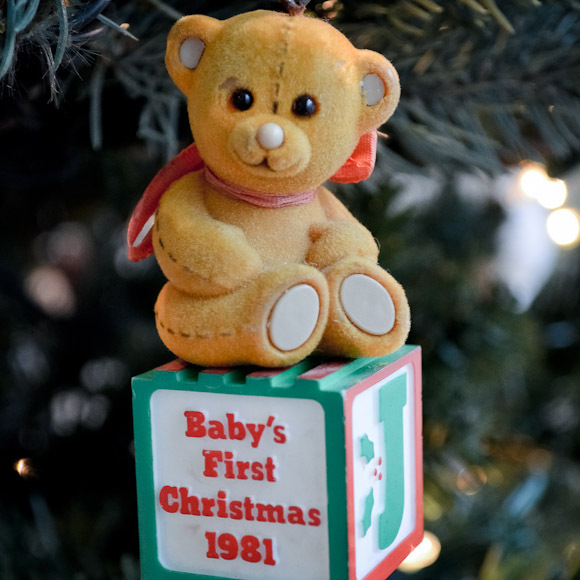 Baby’s First Christmas, 1981. 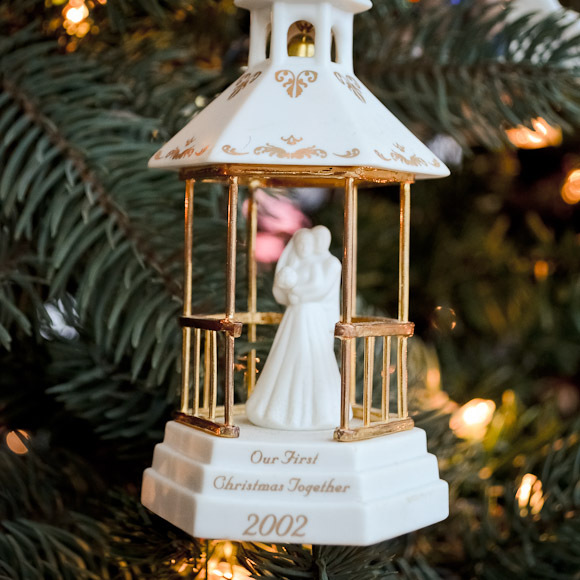 My tree growing up was a hodge podge of collected ornaments as well. I remember asking my parents about each one and relishing the accompanying stories. Mom has since passed down a few of my favorites. Our first Christmas as a married couple was in a small 1 bedroom apartment. It was also the only year we had a “real” tree. Handsome deployed the next month just prior to Shock and Awe in Iraq. 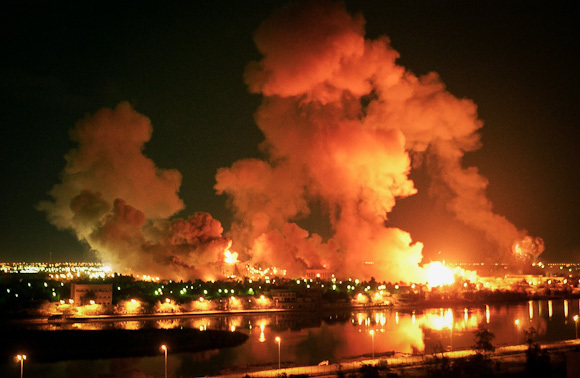 That was the first and last time I ever watched the news while he was overseas. 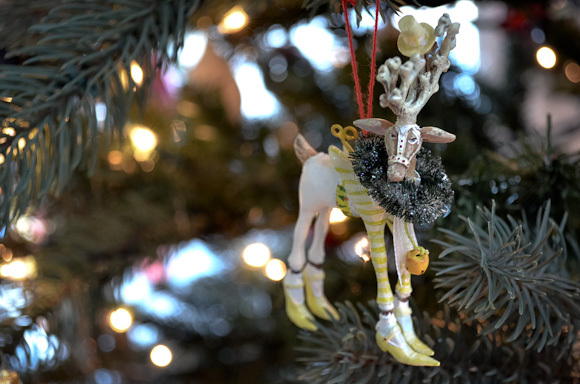 The yellow top hat reindeer that we got in AZ from our dear friends at an ornament exchange. He has lots of personality, just like his gifters! Songbird’s “First Christmas” she was just a month and a half old. It was the first time since my childhood that Christmas felt truly magical again. 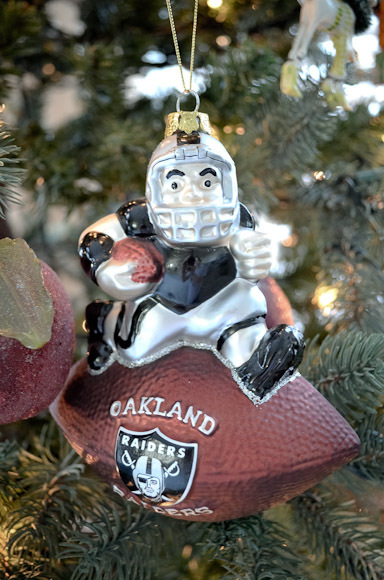 Of course the tree wouldn’t be complete without proper team representation. Handsome is at least his family’s 3rd generation of black and silver fans. Therefore, I am a fan by marriage-induced-osmosis. Every year Grandma L hunts down the most adorable ornaments for the kids. 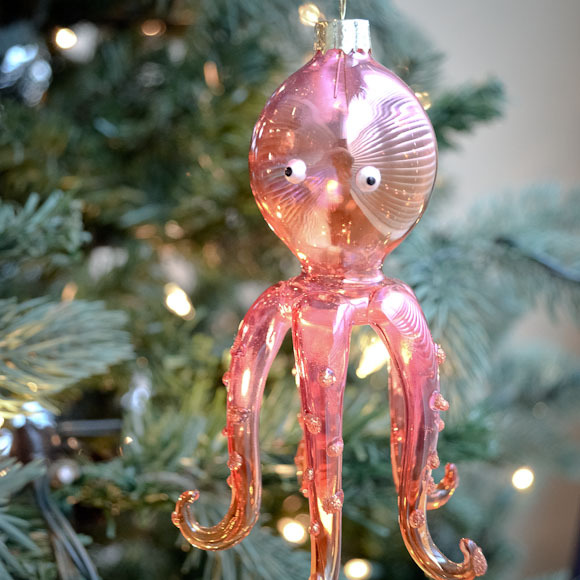 The pearlescent hand-blown glass octopus she gave us while living in San Diego is one of my favorites. 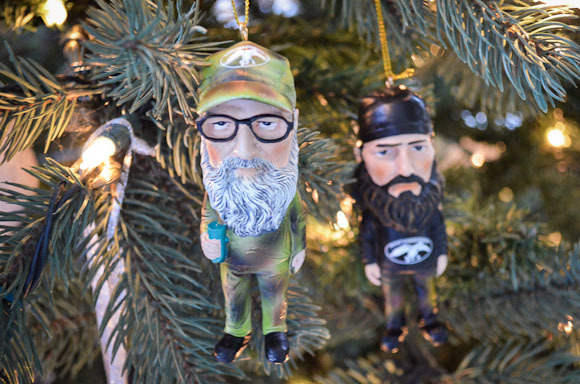 I’m happy happy happy to report that Si and Jase from A&E’s show Duck Dynasty have been added this year. Some day when I pull these out my heart will warm at the memory of us all gathered around to watch a show that my princess 5-year-old and rugged 30-something husband enjoyed equally. As the official tree topper, Songbird asked me this year if we could get a star that lights up. But I’m kinda partial to this glittery white one that resembles it’s paper counterparts. Perhaps some Christmas far down the road, when the kids are grown and gone, I may give the designer tree a try. But until then I think our family tree is as perfect as it gets. Love it! The designer tree is gorgeous but yours is one that makes the heart happy – not just the eyes. 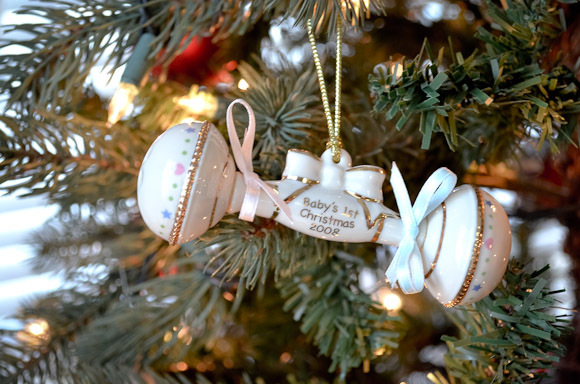 I think the reindeer ornament is hilarious……Thanks for a great post. 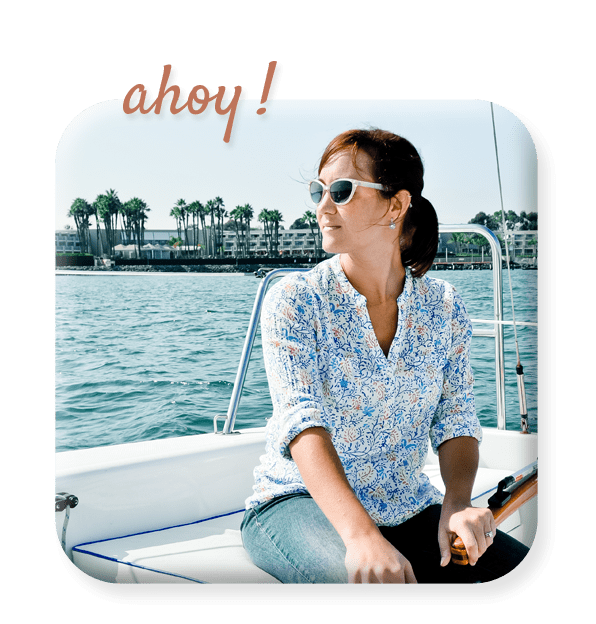 Glad you enjoyed it! The kids are SUPER into the magic of Christmas this year. I’m trying my best to capture and relish this time in our lives. I still have “my” ornaments that are not allowed to be hung on the tree until I get home…and I’m 24. My mom also still has her first ornament from 1958. It has a few cracks but it goes up every year. 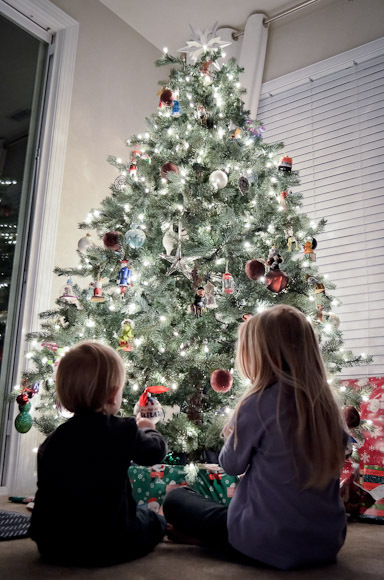 A Christmas tree is just a wonderful cumulation of happy memories. Keep it going…even when the babes move out. 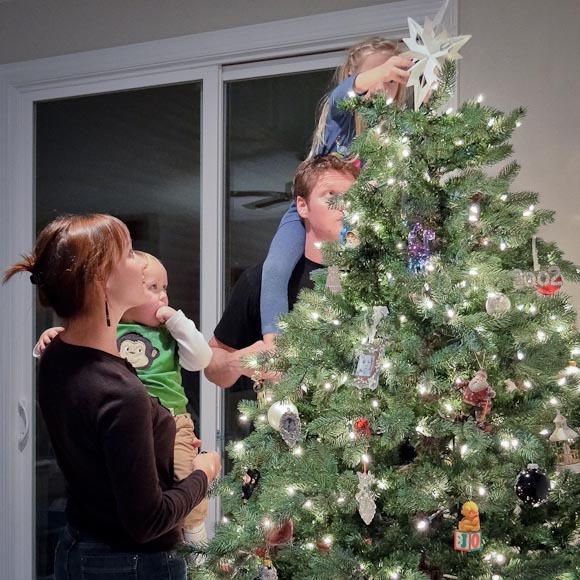 A designer tree will never replace special moments that a Christmas tree can remind us of. By the way…this post made me so happy and so happy to be going home for Christmas. Can’t wait to hang up my ornaments! I absolutely loved the picture of Songbird placing the star on the tree. That is a keeper. I love it too. It’s a good thing Daddy’s tall!